Hello Sweeties🌸 Is me again and guess what I received before my birthday? 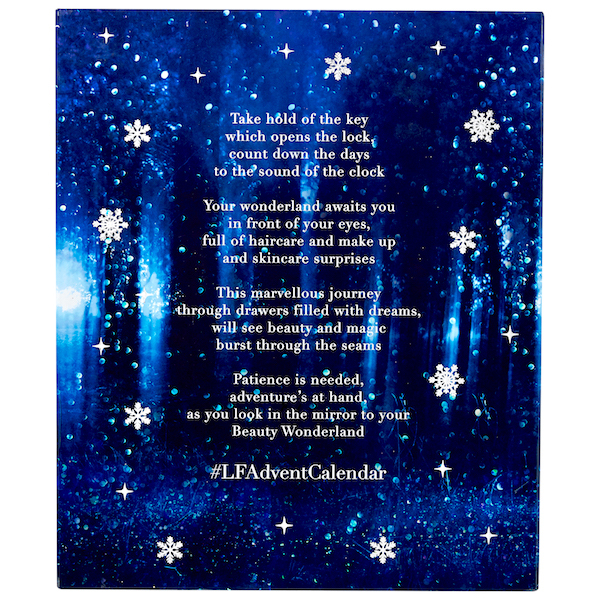 It's the advent calendar from LookfantasticMY. If you follow the trend you will know what's that. Normally during the last month of the year, specially in December, a lot of brands actually love to come out with their own advent calendar to countdown until the christmas day or until the last day of the year. It's something really fun and interesting. I saw lot of vlog featured this kind of advent calendar too. Please look at this! How premium and cute it is. To give you a little more ideas on this premium advent calendar, the total of 25 products including 9 full sized products, 16 deluxe samples, 19 exclusive products, 13 skincare treats, three beauty tools and seven colour cosmetics. WOW! I can't believe this whole box can put so many products and it's getting more and more excited now. I can't wait to unbox each every day. Except the products, the box itself is another highlight point for me to mention on my blog post. Look at the drawing and colors of this advent calendar. It's like the theme of Alice in Wonderland. I love the combination of colours and with a number of treats per drawer the calendar acts as an ideal way to discover both new products and brands. #ChanwonTips: After unbox everything, the whole box can be usable as a vanity unit which is definitely perfect for storing all our beauty /make up products and essentials. Even you can use that to store your accessories or fill up some other product again to surprise yourself or someone else? Isn't it a good thing for you? Opps, I can't resist it and unbox one of it and as you can see, everything packed nicely into these little box and you can now surprise yourself every morning. HAAHAHA I hope to reveal all the product in this advent calendar for my readers but I can't because it won't be surprise anymore if I reveal all 100% products for you. Also a big love and congrats to Lookfantastic Malaysia for the official launch in our country. Remember to check out their official website www.lookfantastic.com and take note of their latest promotion. For now, Lookfantastic is having a 20% off for the first 100 customers and 18% off for the others. Grab it now feel free to follow their give a little love on their Instagram (@lookfantasticmy) too. Thanks Lookfantastic for sending this lovely advent calendar. I'm more than happy to give a shoutout on my blog too. That's all for today. Hope you like it! Product was given as a gift from Lookfantastic and I did not get paid from them but I'm more than happy to share what I love with my readers.